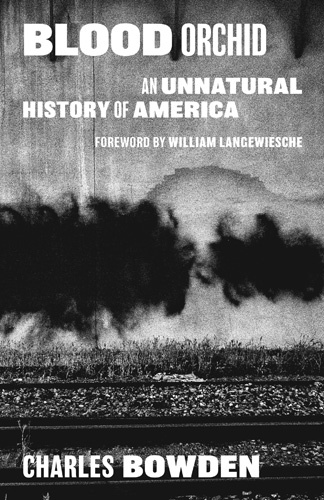 The first book in Charles Bowden’s “Unnatural History of the United States” sextet, Blood Orchid is a dizzying excavation of the violence and corruption at the roots of American society. Through stark observations and visceral experiences, Blood Orchid begins Charles Bowden’s dizzying excavation of the brutal, systemic violence and corruption at the roots of American society. Like a nightmarish fever dream that turns out to be our own reality, Bowden visits dying friends in skid row apartments in Los Angeles, traverses San Francisco byways lined with clubs and joints, and roams through village bars and streets in the Sierra Madre mountains. In these wanderings resides a yearning for the understanding of past and present sins, the human penchant for warfare, abuse, and oppression, and the true war between humanity, the industrialized world, and the immense tolls of our shared land. Deeply personal, hauntingly prophetic, and bracingly sharp, the start to Bowden’s harrowed quest to unearth our ugly truths remains strikingly poignant today.